Writing has been a passion for me ever since I started reading the short stories that I found in my father’s library in our basement. At that time I was supposed to put in everything in my disposal towards landing on one of the sought after seats of one of the “Ivy League” universities in Tehran. With a maximum of four universities on the roster, each admitting a few thousand fresh students and about a million students competing for the prize, this was not a task to be taken lightly. That is how it started: I would read and reread my high school books for hour after hour. In between that activity I would indulge myself in our garden or spend some time with a book. I had been sent to a room in the basement so that I was safe from the daily deluge of the main floor, where my smaller sisters would be living their usual lives that included the TV and other sources of distraction. In the silence of the basement I did take the mission seriously, and yet, at the same time, I developed a love affair with the written word. Coincidentally, the room that I was dispatched to also contained my father’s collection of leftist books and contemporary short stories in Farsi. The plan worked. I got admitted to a top engineering school in Iran and I packed up and returned to the surface. The books, too, followed me. And they stayed with me until I left Iran thirteen years ago. Passion towards the act of writing is a curious business for an immigrant, whose communication skills are one of the first casualties in the new home. How could I write when the mechanism for writing was alien to me? I did insists, though. First, writing in Farsi for a long while at Persian Kamangir. That effort was interjected by attempts at writing in English, a project that reincarnated itself a number of times before landing here, at English Kamangir. I also did a sizeable amount of “serious” writing, on matters related to data clustering and signal processing and also on Iran’s lively quest for democracy and freedom. Those were both pleasurable experiences, and yet, neither was sustainable. My work on mathematics and machine learning was soon cordoned off from the public through subsequent non-disclosure agreements (NDA) that were a basic requirement for my paycheque. Around the same time, I started to have misgivings regarding the subliminal function of the Internet in closed societies. Books such as The Net Delusion were a major contributor to the fact that I started to have serious concerns about “The Dark Side of Internet Freedom”. Was the Internet a means of colonialism in the digital age, disguised under the innocuous facade of cute cats and hashtag activism? There was only one way to know. I had to retreat to the basement and work on it. I enjoyed and cherished working on mathematical problems during the day and writing about them for employers and receiving a properly sized cheque in return. That activity, therefore, was going to persist. I was, on the other hand, going to quit writing about democracy and human right until I had a better understanding of the dynamics of the digital world and its relation with the power dynamics of late capitalism. The closure of my breathing channels garnered the ideal environment that after a few experiments resulted in eternity.py. eternity.py, as its name implies, is a script written in Python and although I used the Anaconda platform, the story of eternity.py shares nothing with the tale of the large snake in the Amazonian wilderness. Since parting ways with the dying alternative Matlab, I had been using Python on a daily basis, in order to experiment with mathematical concepts and to build machine learning models, amongst other tasks. A sizeable portion of these usages occured in Jupyter Notebook, which is a browser-based platform for combining code that is executed with text that may be read by a flesh machine. Breathing day in and day out in this environment, it is no wonder that I started to write my short pseudo-novel on Jupyter and in Python. 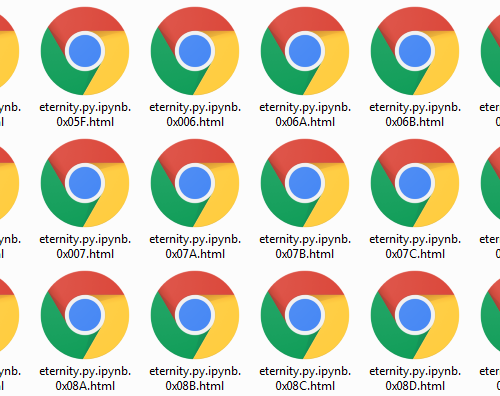 eternity.py is the story of a Python script that starts its execution on the eve of the departure of its author. The script has access to half a million dollars in cash, that it uses to throw parties every year on the same day. The script spends the rest of its time assessing and analyzing the activities of the list of 256 people who have acquired its copies on the social media. At the end of that excruciating period, a subset of the 256 people are considered to be intellectually alive and are invited to the festivity. The details of the implementation of eternity.py that allow it to shoulder this task constitute the bulk of the human-friendly text of the script. The rest of it is the actual implementation of those ideas. eternity.py is also responsible for maintaining itself. It creates a backup copy of itself every time that it is modified and it publishes its 256 copies. And that is a unique feature to that script; there can only exist 256 copies of eternity.py and these copies are all created by the script itself. Practically speaking, after the script executed, I was left with 256 html files that I had to print on an Epson LX-350 impact printer that I had acquired for the purpose of printing the copies of the script. I had also sourced continuous paper, that I purchased as heavy boxes, each of which provided the material for about 70 copies. I also purchased black printer ribbons that I could use for printing 20 copies until the ink faded. I would then roll the copies and send them to the individuals who acquired them on the social media or through Amazon. Here is a snapshot of the list of files that were created. Each one of these unique files contains an engraved ID and looks like below. Click on the image to enlarge. 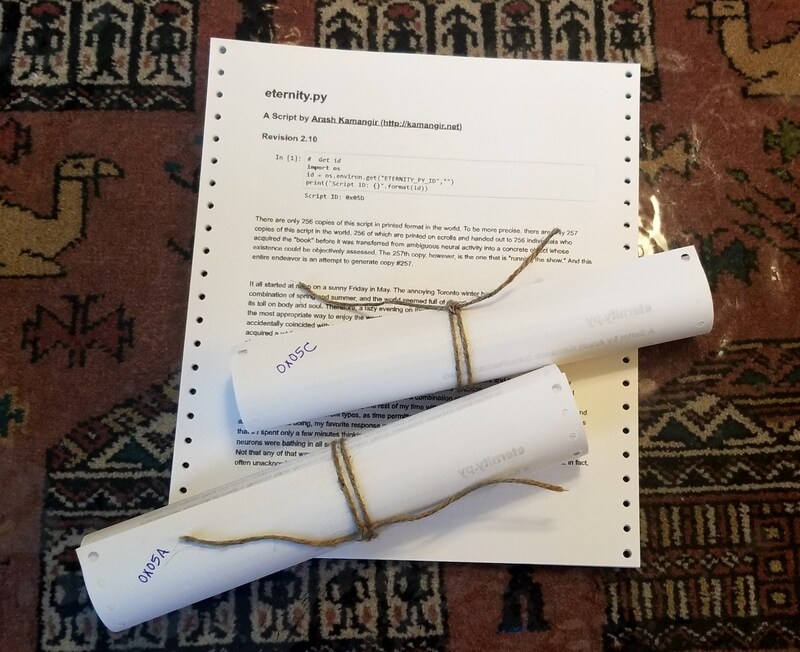 At the time of writing of this text, 91 copies of eternity.py have been acquired. From these, 59 copies have been shipped and 52 copies have been delivered. 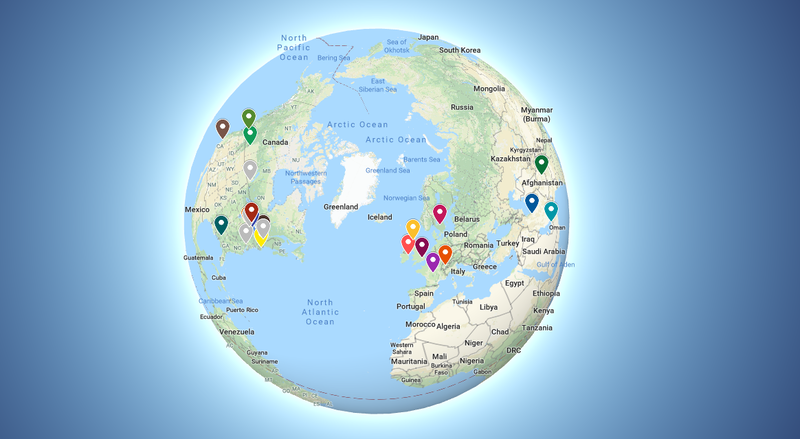 Except for Africa, eternity.py has arrived in every other continent, in total to 12 countries. Click on the image to enlarge or visit the flattened map here. A lot more could be said about eternity.py. Some of it is documented in the @Kamangir channel on Telegram. Instead of dwelling on this completed work, however, I will be spending my time on a second project that is still in its infancy. wish.mp3 will be a larger text, to be printed both in the conventional book format as well as the limited script style. It contains 1+11+1 chapters with the middle chapters acting as semi-independent narratives. The book utilizes an elevated regime of automation, with a separate Python script providing the back-end. While eternity.py resided on a linear scale of 0..256, wish.mp3 takes the readers to a three-dimensional space that utilizes encryption in order to protect the script IDs. I will be posting additional information on wish.mp3 on its tracker and also in @Kamangir.